Description: Learning the Basics has never been more fun! 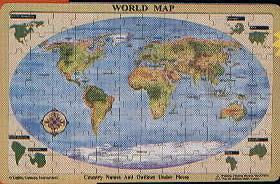 Geography comes to life as kids learn the states, capitals and continents while solving these beautiful map puzzles. Colorful illustration underneath each piece. This is a non-book item and shipping may be more than the amount quoted at check-out. If it is, we will charge the lesser of actual UPS or USPS Parcel Post at our discretion.